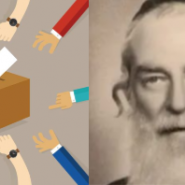 70 years ago, just 4 years after the Holocaust, and after thousands of more Jewish lives had been lost in Israel’s War of Independence, Rabbi Moshe Alpert went very early one morning in 1949, in his finest Shabbat clothing, to vote in Israel’s first elections. Rabbi Alpert clearly saw the miracle, the Divine hand that had orchestrated the establishment of the Jewish State in our homeland, that had enabled those elections to take place in the first place. “At 5:35 AM we woke up, my wife, my brother Reb Shimon Leib and my brother-in-law Reb Natanel Solduchin. “After 2000 or more years of exile, you could say that from the six days of Creation until this day, we have not merited to see a day like this, that we are holding elections in a Jewish state. “Shehechiyanu! Blessed is the One that kept us alive and sustained us and brought us to this day! “So we went to the voting station near Chabashim Street with our identity cards in hand. With great and mighty joy we walked the short way there, and the entire way I walked like it was Simchat Torah and I was circling with a Torah scroll, because I was holding the identity card of our new Jewish State in my hand. My happiness and joy knew no bounds! “The assistant at the voting station brought the ballot box, and the chairman called out to me and said ‘V’Hadarta Pnei Zaken”–‘And you shall honor the old man.’ And he told me that since I was the oldest person present, I would be the first to vote. “With a thrill of awe and holiness, I handed my identity card over to the chairman, and he read out my name from my card and from the book of voters. “And the deputy chairman wrote down my name and handed me the number 1. Then he handed me an envelope and I went into the other room, where there were ballots from all the parties. “And with a shaking hand, moved with holiness, I took one ballot marked “B,” for the Religious Union party, and I placed the ballot inside the envelope I had received from the deputy chairman. “And I reentered the polling room, and I showed them that I held only one envelope. “Then the holiest moment of my life arrived. The moment that neither my father nor my grandfather had the privilege to experience in their lifetimes. “Only me, in my time, in my lifetime, did I merit to experience such a holy and pure moment as this… What joy for me and my portion! “At 6:28 AM, we returned home and went to pray. This was beautiful! Thank you for the reminder! I saw Rabbi Alpert’s picture on a Jewish blog (I’m an artist and I was searching Jewish art blogs) When My wife saw the picture she remarked. “He must be mishpucha.” I said, I’m an Alpert on my mother’s mother’s side, so it’s possible. Anyway thank you for posting this, a reminder that democracy begins with a proper attitude and all is from HaShem. Thank you for posting this. Interesting that they went to vote even before davening! And that the ballot box was open so early!